So after my mentally exhausting day I actually took a mini me break, spent some time in my craft studio and made a project to share with you today! I know....it has been a looooonnnng while! I have been intrigued by a project I came across called the Documented Life Project. This is where you combine an art journal with a planner. Each week they give you a prompt and you are supposed to use it as inspiration for your page. Well I didn't get to start at the beginning of the year so I have been more of a lurker and following how others interpret the prompts and what they create. It is really interesting. I have been fascinated by art journals for a long time, I spend many (way too many!) hours on youtube watching tutorials on art journal pages. Trying to learn tips, tricks and must have products to try and make myself feel comfortable to try it out. It is intimidating but today I decided to just jump in! Now I LOVE how this turned out in the end but I have to say when I just had the background and hadn't got very far I didn't really like how it was looking and felt like I ruined my brand new journal by making a disaster. LOL! But I kept at it adding layers and colors and it really came together. Now I can't stop looking at it and can't believe that I made it - LOL! I really love watching Vicky Papaioannou on You-Tube (She is AMAZING) and she does a great job with her tutorial videos. On one of her videos I watched she said that if you are not sure where to start, cover your pages with tissue paper and it becomes less intimidating. So that is what I did to get myself started. I used Tim Holtz's Melange Tissue and glued it down with Gel Medium. Then I put Faber-Castell Gesso on top and then used distress stains in the colors, Tumbled Glass, Mustard Seed and Spiced Marmalade. I sponged Walnut Stain and Black Soot around the edges. That stunning bird is from the DoveArt Studio collection. I think it is so beautiful! I colored it with copics and then cut it out, popping it up on dimensionals. I added some little pink flower punchies from a Stampin' Up punch to the tree branches to try and tie in with the flowers in the bird stamp. 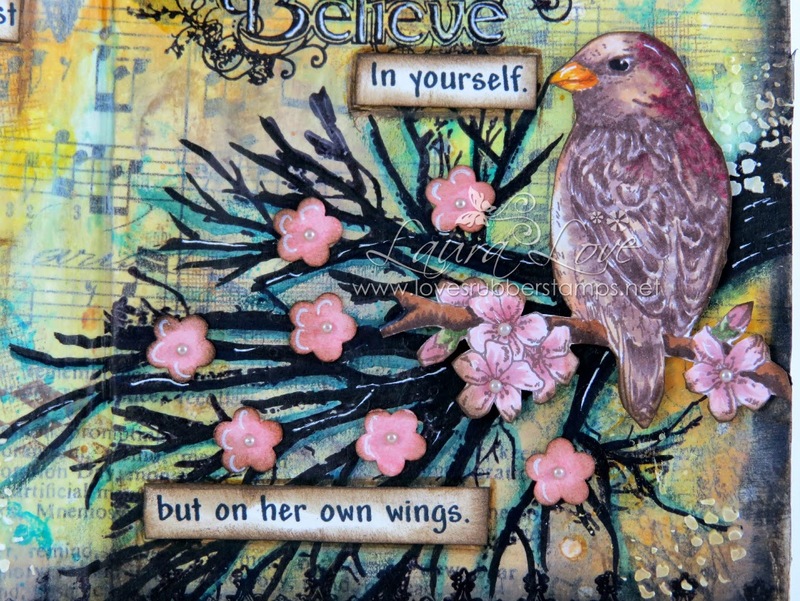 The believe stamp is from a Katy Sue Designs Wishes & Vines set from Flower Soft. I created the sentiment from the computer. One thing I learned is that if you create a sentiment with your computer...don't attempt gel medium on the top...it will be smeary (can you see on the A BIRD part) That is how you learn I guess! I should say that the journal I am using is the small 5"x8" Dylusions Creative Journal. It is a great size I think for this style of art journal/planner and since I plan on using a lot of stamped images it seems like a great size for that. Plus it is WAY less intimidating then the large one since I am a beginner! LOL! Also... I wanted to share a few pictures I snapped of a Male House Finch who was singing his little heart out in our tree the other day :) I have waited all Winter to see some birds so I could try my new camera on some bird shots - LOL! Absolutely fabulous Laura!! Wow love all colours and details, such an artist! Happy you have been crafting again...now I pop over to the shop to see the new goodies! Oh my Gosh, this is so fabulous. LOVE your journal art page. Your hours of lurking and watching really paid off, this is so beautiful. And it's your first one! Your new camera takes great pics! Wow your journal art page is just awesome! I always think about starting one but I just keep putting if off! Maybe you will give me the inspiration I need! This is ORGEOUS, Laura! What a blessing to see that you have linked to our challenge. Thanks so much, and have a blessed week! WOW! Your journal art is impressive, rich with details and images that are captivating! You've certainly found an outlet for your creative expression! Thank you for sharing this beautiful artistry in the ATSM gallery! This is beautiful,I really love this art journal page. The bird and flowers are awesome. Thanks for joining us this week at Sassy Studio Designs. Gorgeous art journal pages, the bird and flowers are fabulous, thanks for playing along with us at Shopping our Stash for the I made this challenge. Absolutely stunning! Thanks so much for sharing with us here at Shopping Our Stash! 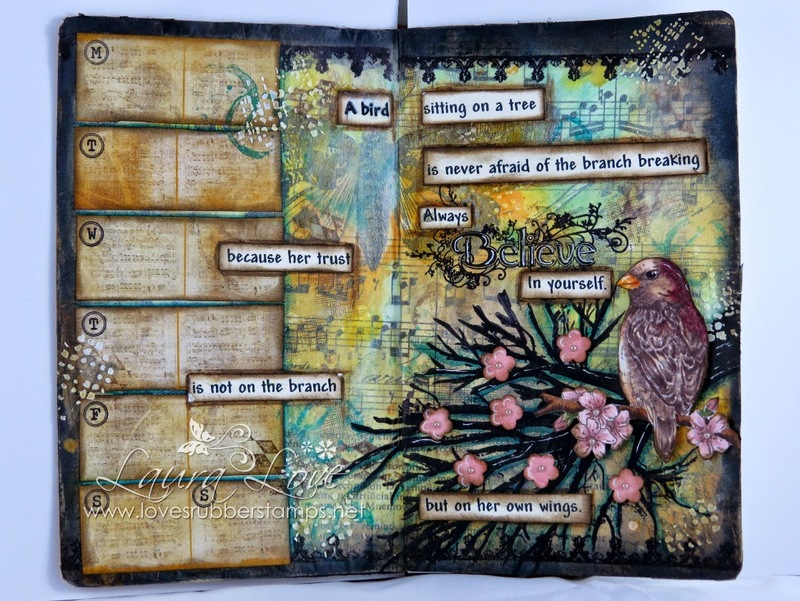 What a gorgeous page....you make mixed media look easy! All the details make this planner a page of wonder! Such a gorgeous journal art page. Love all the wonderful details! Thank you for sharing at ATSM. I had a very happy week-end: my kid had his first basketball match! I love Vicky Papaiouannu too!